I got a sweet deal on a table saw last Fall – a brand-new, in-original-packaging Skilsaw model for $40. 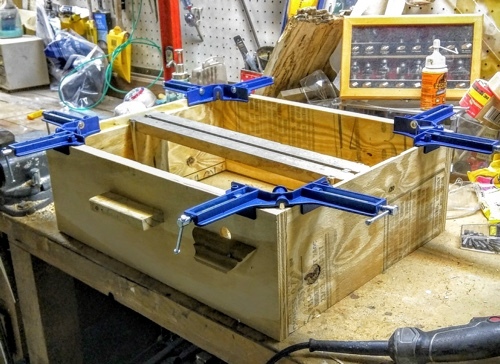 Sure, it’s dinky and light and not accurate enough for really fine woodworking, but it gives me so much more freedom to create larger projects. Especially ones from plywood. With three hives overwintered, my new problem is that I’m running out of equipment. 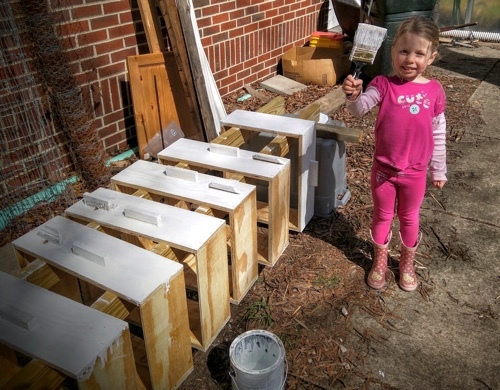 Some people put 6 honey supers on each of their hives – minimum! – in the Spring. I’ve only personally seen 2-4 though, so perhaps it’s different in Maryland. But I had only enough for one super each. Since two of my hives look like they’re really raring to go, I don’t want them to run out of space by backfilling everything with honey and then decide to swarm away because of lack of space! Clearly, I needed more supers and I needed them fast. But buying six boxes takes some serious money. Price-wise they’re only about $15 each, but then shipping something so heavy comes to like $75; all told six boxes were going to end up costing me nearly $200. That much money would buy a heck of a lot of honey. I got some good thick plywood and, thanks to the table saw, easily made my own instead. Rabbets for the resting frames and everything. I wasn’t confident enough to try to route handles in them (and didn’t want to expose more of the inner surfaces of the plywood to the elements than I absolutely had to) so I nailed on handles instead. That hole and its pretty little landing pad are very important parts of a honey super, saith Rusty in this article from Honey Bee Suite. The idea is that bees will much more readily draw comb and store honey in supers that make it convenient to do so. That is, they’re more likely to use a honey super that isn’t perched on top of a tower of boxes with a single bottom entrance that forces them to climb all the way up and down the tower each time they want to deposit some nectar. I’ll give it a try. She actually did help quite a bit! 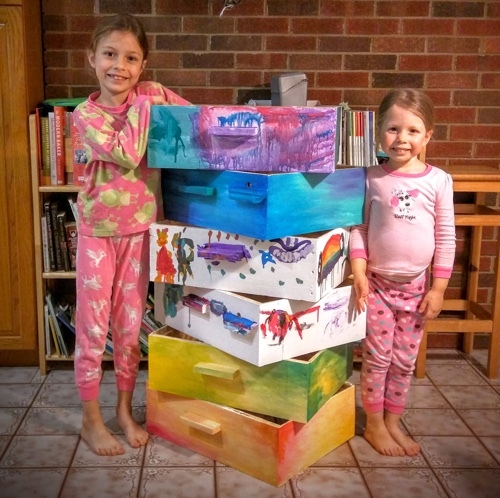 Because I want more color in my bee yard, I invited the girls to help me make these boxes less boring. Using all the little dribs and drabs of paint from cans in the basement, I think we did a pretty darn good job! I think they’re beautiful and I can’t wait to use them. Just gotta do a clear coat on top and then wait for warmer weather before I open the hives. This entry was posted on Thursday, April 7th, 2016 at 2:07 pm	and is filed under Crafts, homesteading, bees, building. You can follow any responses to this entry through the RSS 2.0 feed. You can leave a response, or trackback from your own site. Atom, Entries (RSS .92), (RSS 2.0) and Comments (RSS 2.0). 26 queries. 0.222 seconds. Top.